Chris Curnow (Homepage) wrote: Amazing composition with everything pointing to top left corner. 613photo (Homepage) wrote: The density of this shot is really amazing. I like the "6" in the corner, too. Marie (Homepage) wrote: excellent graphisme ! LightningPaul (Homepage) wrote: Nice! Great framing and composition. Very artistic tone mapping. I'm just missing some vignetting and darkening at certain places. Andrew (Homepage) wrote: Clean, but spooky futuristic feel. Nice shot! 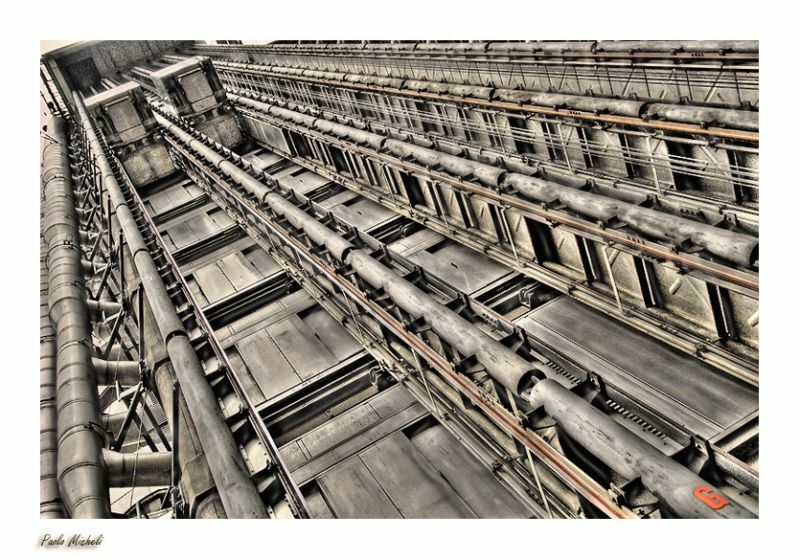 Craig (Homepage) wrote: Industrial, futuristic looking, great perspective and well processed! Gromitch (Homepage) wrote: Great line perspective and work with dynamic range! Marcah (Homepage) wrote: Wonderful image. Your perspective as well as the processing is excellent. Polydactyle (Homepage) wrote: Excellent again. A other great industrial view. Nice treatment. Elaine- (Homepage) wrote: this is fabulous!! so 'techno' and 'grunge' lol great shot man!! grant (Homepage) wrote: excellent! very powerful lines! Andy (Homepage) wrote: Wow an amazing shot! Love the framing and the mechanical feel. Krims@nline.be (Homepage) wrote: Great compo! Miles Wolstenholme (Homepage) wrote: Congrats on an incredible composition, this is just amazing. Well done! Pedro (Homepage) wrote: Excellent framing, Paolo, absolutely geometric. I like your work with Lloyd´s. Ciao. Tom (Homepage) wrote: Cool! It looks like shuttles on a space station or something. Looks a bit like the Lloyds Building in London?